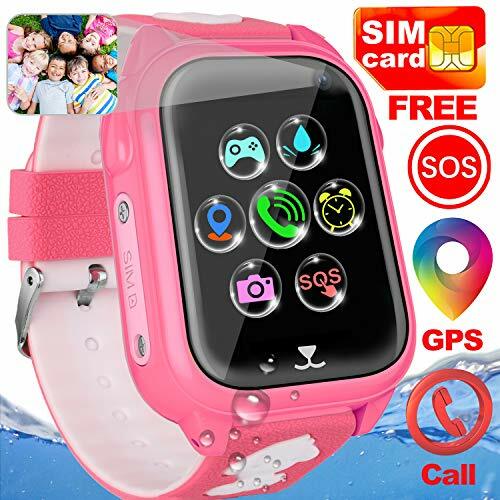 - 🐳【SIM Card Include】2019 Latest Version with GPS accurate positioning system and IP67 waterproof - Highly recommended it for your kids cause the precise tracker can make sure your kids safe day and night. With the IP67 waterproof so that you don’t need to worry about the watch will be damaged while the kids washing, bathing or swimming. - 🐣Most adorable puppy sharp and theme with New process technology – Show you a different smart watch on Amazon. This watch gathering all the features. Not only the precise GPS position and IP67 waterproof, but also support 300,000 pixels camera that your kids can record the fun time with their friends, High-definition and sensitive touch screen,Math game,Phone Call,pedometer,SOS Emergency call,Micro Chat,Touch friends. Parents can controlling and settings via app. - 🦌 One Button to SOS Emergency Call – Press SOS button about 3 seconds, the watch will automatically call 3 SOS numbers in 2 rounds until answering the call. At the same time, the alert notification will be launched to APP. (This Emergency function will work under any mode. )Two-way calling function allows you to contact your child at any time, convenient and safe! Te lo compro en Usa es tu tienda amiga en línea en USA! Hemos creado este portal de compras especialmente para ti brindándote una maravillosa experiencia de comprar en línea todo lo que desees en tan solo un click. Con nosotros no necesitas casilleros ni mucho menos redireccionar tus compras. Todos nuestros productos incluyen envío, impuestos y aranceles hasta la puerta de tu casa u oficina.Todo en un solo lugar y sin gastos ocultos.